This combined with building up momentum after finishing a task–whether homework or a bit of writing–makes it difficult to step away from the computer and head to bed. Or to get in the shower and then go to bed. I’m tempted to do just one more thing: write one more line, do one more homework questions, read one more chapter. Because it’s only one thing, right? That’s true until one thing morphs into a second thing when I tell myself I’ll just do one more, and then the cycle repeats until it’s well passed my bedtime. Trying to squeeze writing in between the hours I’m committed to my job and to school has only made this habit worse. I want to write. I will write. I just need to get better about parsing out my time and only spending half an hour re-watching YouTube videos instead of an hour and a half. The time I have after work or after class and before bedtime is pretty finite. And it doesn’t do me any good do do just one more thing before saying that the day is over because it’s really just refusing to admit that I’m out of time but not out of things I want to do. On that note, I need to get off my computer, head to the shower, and then tuck myself into bed. Goodnight to all, and to all, a good night. It’s Here: Down with the Fallen! 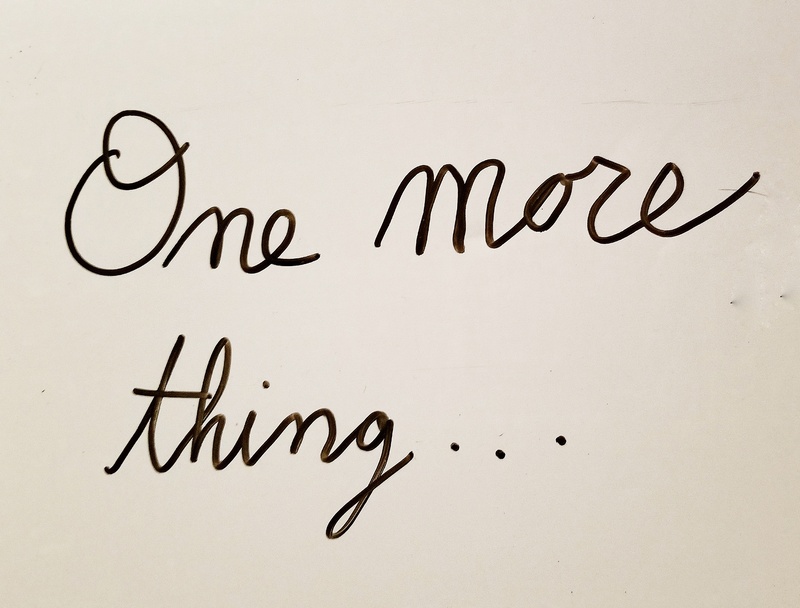 Always just one more thing! I get it. Just keep swimming, that’s what I say.